The blood of thousands are spilled. Tens of thousands of people are detained. Millions are displaced. Over 50,000 people are made refuges in one day. Hundreds of thousands of Ethiopians are made bond slaves in the Middle East. Three point five MILLION people lost their land to TPLF and foreign land grabbers. Over half Ethiopian population live in absolute poverty. The Ethiopian youth see no hope in the country where 962 TPLF affiliated individuals control over 70% of the Ethiopian economy. The Ethiopian military, security and police apparatus are used as private security firm of the TPLF that kills, displaces, evict and dispossess the Ethiopian people to enrich handful of TPLF mafia leaders and robbers affiliated with them. Ethiopia needs fundamental regime change. Only the hope of fundamental regime change stands between outright revolution and civil war in Ethiopia. 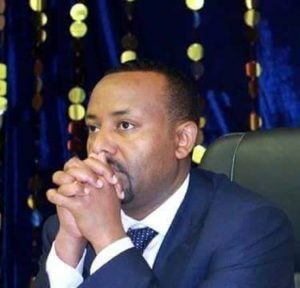 Prime Minister Abiy and all the progressive forces in the OPDO, ADNM and SEPDM cumulatively have the responsibility to lead transformative regime change to prevent revolution and civil war in the country. The Ethiopian people do not expect reshuffling of useless cabinet positions. Transformative regime change should be initiated immediately. That responsibility now rests on the new prime minister. Prime Minister Abiy should take the following minimum measures to initiate those fundamental transformative regime change. Prime Minister Abiy has the full support of the Ethiopian people and the Ethiopian constitution. The New Prime Minister has all the powers in Ethiopia that comes from the Constitution and the Ethiopian people. As such, the Ethiopian people expects Prime Minister Abiy to be full Prime Minister, not half, not three quarters, but full Prime Ministers who is capably of forming his government by establishing his cabinet to initiate transformative regime change. Therefore, we expect Prime Minister Abiy to be assertive and decisive in his first move in establishing his government and picking progressive cabinet members to initiative transformative regime change in Ethiopia. As he take the reign of power in Ethiopia, Prime Minister Abiy should lead the country by his own clearly defined vision that will help him bring transformative regime change not by the TPLF introduced Marxist-Leninist “Revolutionary Democracy” and “Democratic Centralism”. All the progressive forces in the OPDO, ANDM and SEPDM must do away with the theory of revolutionary democracy and democratic centralism, the tool of control TPLF introduced to facilitate direct and indirect rule in Ethiopia. 3. Eliminate all the Cluster Based Deputy Prime Ministers and Advisory Positions created during Hailemariam Era. Prime Minister Abiy should eliminate and abolish all Hailemariam era practices that gave the power of the Prime Minister to cluster-based deputy prime ministers and advisors. Therefore, the positions of 1) finance and economic cluster deputy prime minister, 2) the civil service reform cluster deputy prime minister, and 3) all the advisory positions given to TPLF gurus should be totally eliminated and abolished for the Prime Minister to exercise the full power constitutionally granted to him. In order to immediately initiate transformative regime, the new Prime Minister must appoint his own people at key sector ministries such as Ministry of Defense, the Army Chief of Staff, the Head of National Intelligence, Ministry of Foreign Affairs, Ministry of Finance, Ministry of Federal Affairs and Ministry of Justice. Other sector ministries dealing with the economy such as Agriculture, industry, investment and transport are also important. He need to appoint his own Ambassadors in key countries as well to execute his own foreign policy, It is also advisable to include opposition party leaders into the cabinet position. 5. Separate the Ruling Party from the Government. The New Prime Minister must take immediate measure of separating the government and the ruling party, the government bureaucracy from the cadres of the EPRDF. Merit, not party membership should be the basis of government employment. The new ministers should be mandated to dismiss all cadres and free loaders the TPLF planted in the government offices and Ethiopian diplomatic missions abroad. 6. Establish Constituency Office to communicate regularly with the Ethiopian People. The New Prime Minister should immediately establish constituency office that will mobilize and communicate with the Ethiopian people on the visions and daily activities of his office. 7. Empower the People to Elect their Local Leaders. The Ethiopian people should continue their struggle by removing all TPLF affiliated agents and surrogate from their localities including in the government and business community and replace them with progressive leaders that will work with the new prime minister.